Earlier this year it was announced that the DC Comics anti-hero Constantine would be returning to the small screen in a new animated series on The CW’s digital platform, CW Seed. Constantine will be joining the ranks of other DC animated CW Seed series like Vixen and the upcoming Freedom Fighters: The Ray, which set out to further explore The CW’s so-called Arrowverse. Matt Ryan, who portrayed Constantine in the now-cancelled live-action series on NBC as well as brief cameos on Arrow, will be voicing the character. Using this year’s New York Comic Con as their outlet, Warner Bros. TV delivered a first look at the upcoming series by providing a bloody and action-packed 3-minute clip. The clip sees Constantine faced with a group of demons and ends with him in a pretty tough spot. 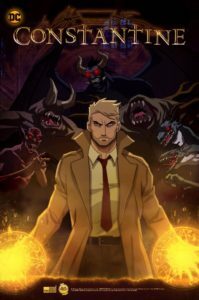 Produced by Greg Berlanti (Arrow), David S. Goyer (Batman v Superman), and Sarah Schechter (Riverdale, Legends of Tomorrow), Constantine is set to premiere on CW Seed in 2018. Check out the full clip below and feel free to let us know what you think in the comments.